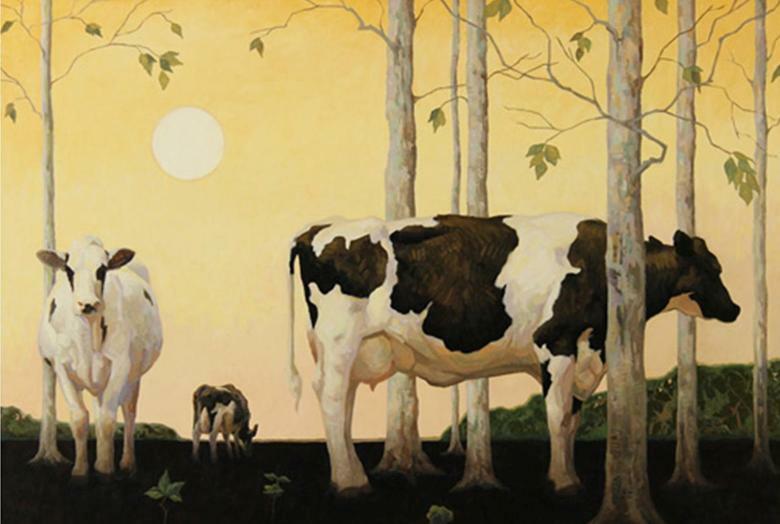 From his studio in Door County, Wisconsin, Craig Blietz creates masterful paintings of farm animals and rural imagery that celebrate the dignity and quiet beauty of agrarian life. 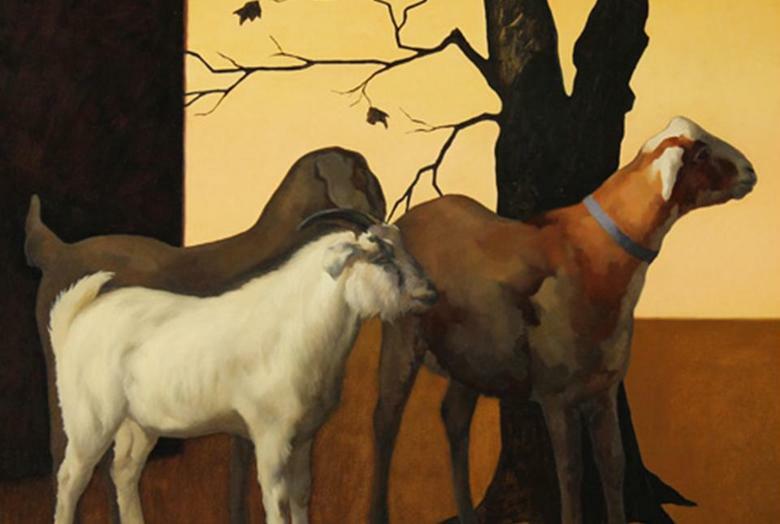 This exhibition features a new body of work by Blietz, Close to the Forest, reflecting the inspiration he gleans from the serene landscapes and noble depictions of animals by French Barbizon School artists, many of whom are represented in the Paine’s collection. My pulse quickens when I imagine the Barbizon School painters of the 19th century trekking southeast from Paris to make paintings of the Forest of Fontainebleau. I picture the forest with an articulated perimeter. Like the ocean—another imposing natural wonder—you exist either within it, or outside of it. My point of view in the Close to the Forest paintings is from the outside. Approaching a forest triggers moments of intense anxiety, much like the unease created by a storm on the horizon or the stressful suspense of a pending athletic contest. Anxiety and anticipation are at their peak just prior to experiencing the actual event. That is not to say that stepping foot into a forest does or should relieve the apprehension. Poet Todd Davis, Professor of Environmental Studies at Penn State University’s Altoona College, remarked to me during a recent hike that, “Nature doesn’t care if you live or die.” I believe we recognize this, albeit subconsciously. Nature is a place for thoughtful, cautious and careful reverie. I continue to place farm animals in my work, as they are convincing emblems representing the place I live, work and dream. I find them to be remarkable non-verbal storytellers. The formal elements of painting provide another vehicle to convey emotion, narrative and mood. Shape—both graphic and fully rendered—and color both help me express the mystery and anticipation of standing before an enormous forest. As I am passionately attendant to art history, I have made direct reference to paintings of the past, such as Jean-François Millet’s The Gleaners (1857) and Barnett Newman’s “Zip” paintings of the mid-20th century. I see parallels in the reverence and concern the Barbizon painters had for the Forest of Fontainebleau, as well as our contemporary society’s interest in, and efforts to save, our own natural wonders. In the Close to the Forest paintings, I convey through sign, symbol and metaphor the awe I feel when I imagine standing outside the mighty Forest of Fontainebleau.